The definition of broadband has changed. It has become more than just high speed Internet access. The term broadband now refers to the means of quickly transporting electronic information of all kinds quickly from one point to another. The broadband network is like a highway system and, in fact, follows our CALTRANS highway system. The big fat feeder pipes usually run down the main highway arteries and carry a lot of information capability. Then the smaller highways and roads are referred to as “middle mile” for the network distribution. The “last mile” gets the data from the road to a residence and back again. The critical measure is the data transfer connection speed for the data through the network. Dial-up is insufficient because it cannot move the data fast enough for the technology available so dial-up users have a hard time doing computer updates or receiving a picture or accessing most websites. Just so you can get the picture, the estimated time to move 1 Gigabyte of information by dial-up is 3.5 days. True broadband is more than the National Broadband Plan minimums of 4 Mbps download speed and 1 Mbps upload speed. Cable and fiber connections qualify. New ADSL and some cellular connections make the grade. More detail is noted below. 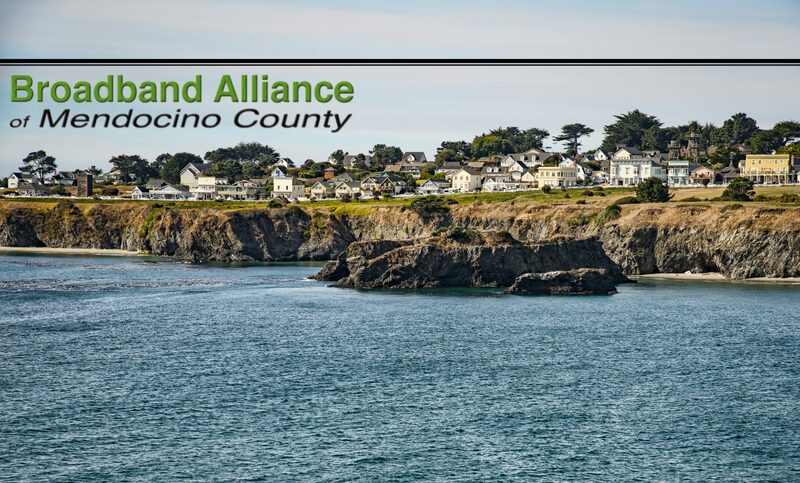 Unfortunately most of Mendocino County has less than true broadband, which is why the Broadband Alliance has formed to change that in the next few years. Broadband is now an essential public infrastructure and cornerstone of community life. It is how you access the Internet and the Web — and more. For example, mobile telephone service is delivered over a broadband network using VOIP (Voice over Internet Protocol). Video conferencing over the broadband network through services like Skype saves business people time and money with video conferencing and allows friends and family to see each other while chatting. Utilities use broadband to monitor your electricity and gas. Fire, Police and Emergency Medical services use it to connect in the field. Hospitals, care centers, and pharmacies depend on broadband for patient services. Home health monitoring, security and other services use broadband. Broadband will soon replace traditional dial tone as you know it. Large urban areas already have Comcast’s “Triple Play” or AT&T’s “U-verse” which bundles Internet, telephone and TV, and some areas in the County may also have this available. If you currently have cable for TV or use Direct TV, it may be possible to get high speed Internet with the same company. Look at the “Fed Up with Dial-up? – what to do” page for suggestions on what to do until the real thing comes to you. Also look at the page called “Internet set up from cell phone server” for a way to use a cellular phone signal to get higher speed Internet than dial-up. Previous PostPrevious Why Is Broadband Essential?